Up to nine new lifts in three states could be running before the end of the ski season. The 2017-18 ski season is here and soon newly installed lifts will be operating. 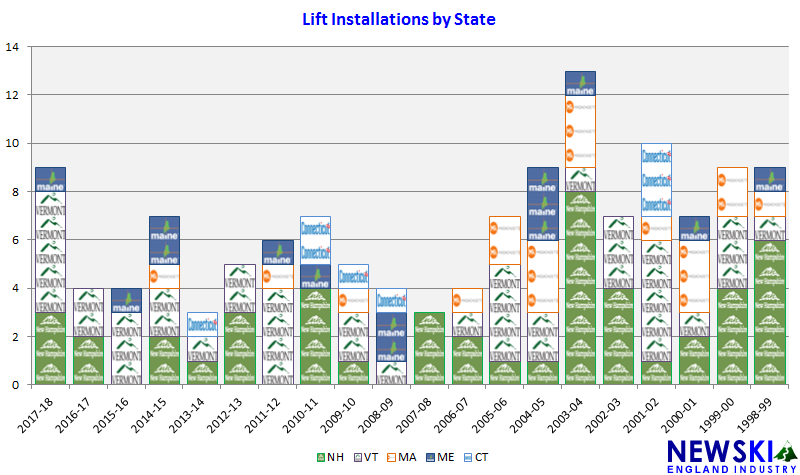 After one of the worst lift installation years on record in 2016, New England's ski lift business has rebounded with 9 aerial lifts under construction in 3 states in 2017. Four of the lifts under construction are T-Bars, making 2017 the largest T-Bar installation year since the 1970s. 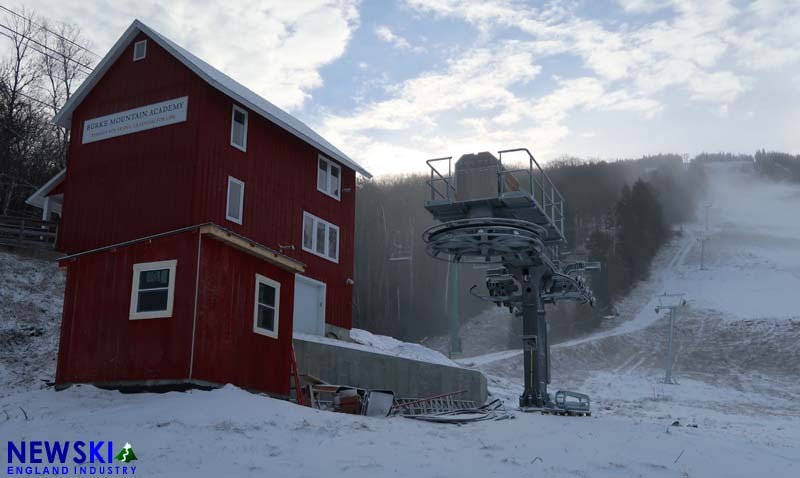 For the second straight year, no detachable chairlifts are being installed. Six of the nine lifts being installed are brand new, with Doppelmayr leading the way with three. Leitner-Poma and LST are only installing new surface lifts in New England this year. In Maine, Sunday River will soon be opening its new fixed grip triple chairlift on Spruce Peak. The new Doppelmayr replaces a Borvig, which suffered a footing failure in 2016. 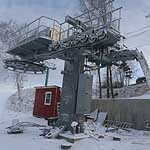 In New Hampshire, Pats Peak is nearing completion of its new summit lift, replacing the original Mueller double chair. The Peak Triple is a refurbished CTEC, originally installed at Ascutney in Vermont in 1986. The lift has been significantly upgraded and will feature new tensioning and a loading carpet. Whaleback is awaiting final state acceptance for its West Side T-Bar. The refurbished Hall was originally installed at Plattekill in New York. Waterville Valley has completed concrete work on its new High Country T-Bar. Since the lift will not be completed for area's upcoming opening day, the High Country chairlift will remain in operation for one final winter. The new LST T-Bar could debut later this season. In Vermont, Sugarbush's new Doppelmayr quad chairlifts could be transporting beginners soon. The fixed grip chairs replace ancient double chairlifts on both sides of the resort. A new Leitner-Poma T-Bar is being constructed at the defunct High Pond ski area, which is set to reopen this winter as a private operation. Burke Mountain's new Leitner-Poma T-Bar is nearly complete, with the towers and base terminal in place. The lift replaces Burke's historic Pomalift. Magic Mountain's Green Chair installation is currently on hold, as Ski Lifts Unlimited's George Krueger is undergoing medical treatment in Maine. According to Magic Mountain's November 13 update, a the estimated completion of the refurbished Borvig double chairlift is unknown "until substitute contractor frees up."